Antonia works with the missions group, Segadores, a group that is dedicated to reaching previously unreached Amazonian jungle tribes. She has a deep love and vision for ministering to the needs of missionary children in Segadores and also to the children in the Amazon jungles of Peru. Antonia's ministry is called “Heirs of Grace” (PER10a). She frequently visits the Amazon jungle and the work being done among the Asheninka tribal group. Antonia also works with the tribal women training them in home skills such as sewing. 1) They are taught the Word of God in school and in the church. 2) Every Sunday the children that attend the church are given a nutritious breakfast. 3) Vitamin supplements are given to the children studying kindergarten in the school, as well as to the children in the village that live in extreme poverty. 4) A feeding programme for school children provides breakfast for all of those in primary school (it was found that most of the children with poor grades have not had breakfast). 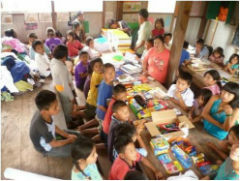 5) Orphans and neglected children are given school supplies at the beginning of each school year. 6) Some of the families are taught how to raise chickens, and are given chickens and a chicken-coop, so that they can feed their children eggs. 7) Teacher-training is given to native teachers of tribal children twice a year. 1) Sponsors are sought for each child. These commit to pray for the child on a regular basis, and to give them a call when their father is on a missionary trip. The sponsor also provides a gift to the child on their birthday and Christmas. 2) They are helped with school supplies. 3) The parents are given instruction on important subjects that help them be a better parent. 4) Once a year (usually near the end of the year) the children and their parents are taken on a short outing to a recreation centre, and new clothes are bought for the children. 1) Bible classes are given to them every Saturday afternoon in the Segadores Centre for Mission. In this way many of the children have come to know God. 2) The children are served a plate of food every Saturday because many of them come to the classes without having had lunch. 3) Their birthdays are celebrated and they are given a gift. At Christmas they also receive a gift. Antonia was involved in the work of Segadores before Bright Hope World became involved. Our partnership has helped her to meet her financial outgoings and so enabling her to be more focused on the work that the Lord has called her to. 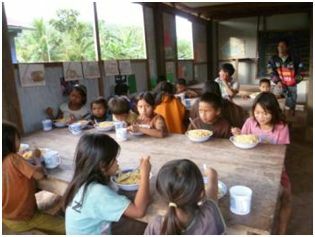 This project directly provides financial support for Antonia but the Amazon tribal children and women and missionary children in the jungle also indirectly benefit from this project. Antonia has a deep passion for the women and children of these unreached Amazonian jungle tribes and frequently visits to preach the Gospel. This has changed lives and been a blessing to the children she shows God’s love to. Antonia was born in 1960 into a Catholic family in a rural community in the state of Amazonas. She has three sisters and one brother. All the family worshipped idols so she never heard about Jesus. However, her mother had a Catholic Bible that Antonia read secretly. In 1977 she became a Christian at an evangelistic campaign in a nearby town. After finishing her high school studies she studied theology through extension courses at the Evangelical Seminary of Lima (1992-1996) and graduated with a Diploma in Pastoral Theology. In Lima she attended a Christian Missionary Alliance Church and began working with small children. 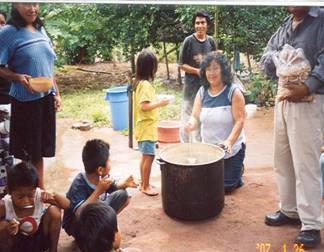 In 1993 Antonia learned that Segadores trained missionaries. She participated in one of their training programmes that year, in the theory and field practice; then continued participating during her summer vacations until finishing her seminary studies. After graduating from seminary (in 1996), Antonia joined Segadores, and entered a ministry of sharing God’s love to children of exploited and forgotten tribal villages of the jungle. Through her cross-cultural experiences, she felt God’s call to help forgotten (or neglected) children in tribal communities. Soon she called her ministry “Heirs of Grace”. 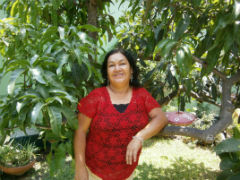 She is the treasurer of Segadores and a member of the Board of Directors. She suffers from a back ailment following a fall from a horse, our financial partnering with her helps with these medical needs. 1) For children and women to be presented with the gospel in the jungle regions of Peru and shown God’s love as well as training them in various practical life skills. 2) That as many people as possible in these small villages have the opportunity to respond to the gospel and that new Christians will in turn become disciplemakers.